is trying to get a ton of the last-minute small details done but not getting enough sleep! until tomorrow at 9:00 a.m. AZ time (1600 GMT). More later as things really get going!" I jokingly call the day before the ATY races begin "Day Zero" since the race days are officially called Days 1, 2, and 3. It felt like ground zero this year; so many things were happening, and Jim and I were even more in the thick of it than we were last year. Fortunately, the weather got warmer on Sunday. It was below zero degrees Celsius the previous two mornings at Nardini Manor (upper 20s Fahrenheit). That's colder than average at a thousand feet of elevation in the Valley of the Sun. Runners were fortunate during the race this year that each day was warm and sunny and the night-time temperatures, while typically cold in the Sonoran Desert after the sun goes down, were a little warmer than during last year's race. Many runners coming to the event for the first time are surprised how cold southern Arizona can be at night in late December. 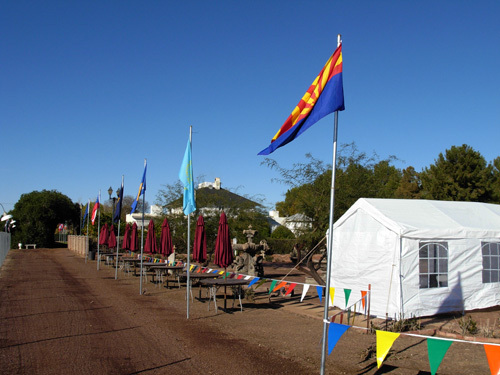 The new remote "quiet tent" is ready to accommodate its assigned runners on 12-28-09. Since Jim would start his 48-hour run on Monday (Day 1) he got up a little later on Sunday morning, just in case sleep eluded him the night before his race. (Good decision; it did.) His main goals for the day were to rest as much as possible and to get his clothing, gear, and other items ready. He still found the energy and time to assist with a few more pre-race chores in the morning before runners began arriving, however. He worked with Dave and Rodger on web cam issues, put up more tent walls, and found some other light tasks to do. It was hard for him to just sit still. Me, too. I didn't worry about wearing myself out, though, because I wasn't running until Wednesday (Day 3) and was going for "only" 24 hours, not 48. I helped Jim set up our personal aid table and chair across from the mailboxes, near a lamppost and stone bench that various runners used over the next three days. We'd carry his supplies out there in the morning. Don Lundell and Gillian Robinson were on one side of us the first two days, then Kay Blom and her crew (husband Keith) on Day 3. Robert Andrulis, Lynn Newton, and John Geesler were other neighbors toward the timing mat. In the photo below, our table and chair are in the left foreground. Jim took the picture on Day 3 as I'm running toward him. The timing booth is behind me and the mailboxes are on the right. After Jim went back to the camper, Cody and I picked up pine cones in the treed area, walked around the track one last time, checked on the "bag room" to be sure everything was ready for registration that afternoon, and got last-minute instructions from Rodger regarding a few specific runner's situations that I'd need to handle during check-in. That was the last time for several days that Cody and the Wrubliks' two dogs had the run of the place. Then I got to socialize with incoming runners for a little while as they began trickling in around lunch time. That's one of the most fun aspects of this or any other race: greeting and hugging old friends, and meeting new ones that will be "old friends" in another three days. HELLO! IT'S GREAT TO SEE YOU AGAIN!! 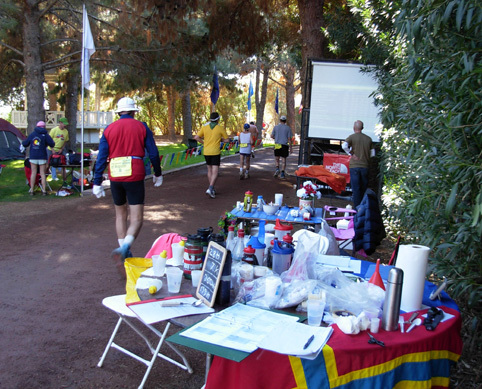 Runners began arriving late Sunday morning to set up their cots or little tents in the big 60x100-foot heated tent, decide where to put their personal aid stations along the track, and check out the course improvements they'd read about on the race website. Most of them were entered in the 72-hour race or the first wave of the 48-hour race, which began at 9 AM the next morning. All of them knew that space in the big tent would be at a premium this year because more runners were entered in the race than ever before (at least ten more in the 72-hour race than last year and a couple more in the 48). Cots and sleeping bags go in the middle, tents around the perimeter. 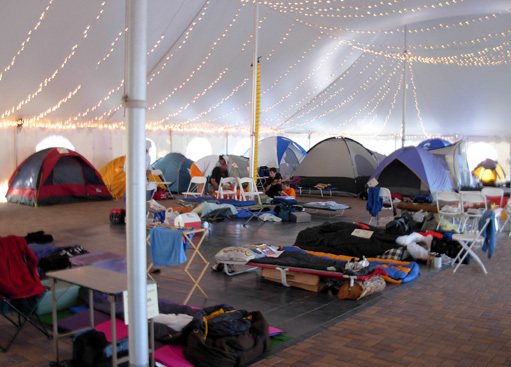 Race organizers encouraged the runners to limit their tents to 10x10 feet or smaller and warned them that even with smaller tents, there wouldn't be room for everyone inside the big tent. It's first-come, first-served, so Sunday arrivals were soon jockeying for floor space. 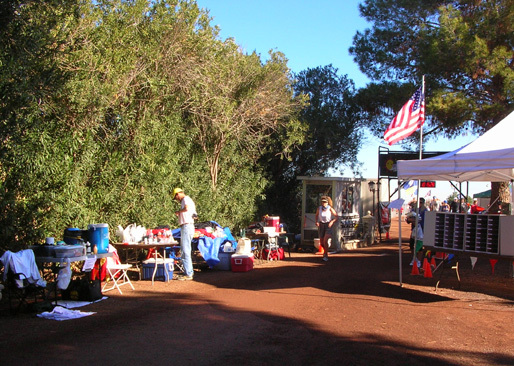 Veteran ATY runners know they need to be among the first to arrive so they can have a better selection of places to set up their tents or cots. 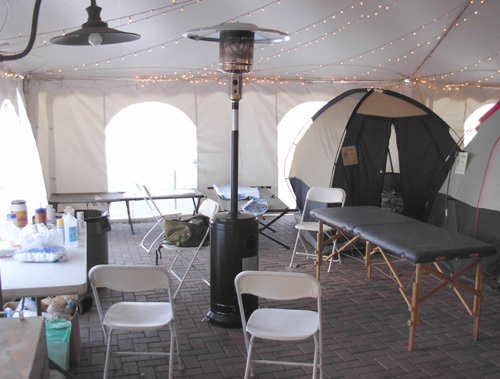 One corner of the big tent is reserved for Christopher's and Andy's busy medical area. Those who arrive later may find themselves out in the cold, literally. Of course, some runners choose to set up their tents outside in one of the grassy areas where it's quieter and they have more room. This is also the suggested option for runners with several crew members and/or kids who will be staying at Nardini Manor overnight since space is at a premium inside the big tent. There isn't enough room for crew members to erect separate tents inside. 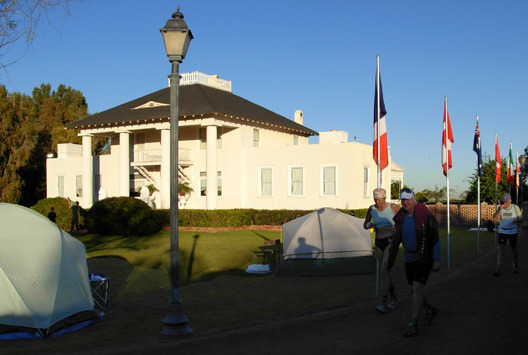 Runners pass several tents set up near the track in the front yard. Other runners who would be sleeping in their campers, vans, or SUVs in Nardini Manor's parking area or in nearby motels also trickled in throughout "Day Zero." It was like a homecoming -- or family reunion, since this race truly has a family feel to it. The majority of runners each year have been here previously. First-time ATYers soon feel like they've been here before, too. I know that's how Jim and I felt last year. Veterans are usually eager to answer questions and help the newcomers feel right at home. To me, that's one of the best things about ATY and now I make it my job to give a warm welcome to first-time ATYers, too. A fixed-time race on a loop this short is a very social event. Runners are never alone at ATY for more than a few seconds, even at night. It's one of the biggest differences between fixed-time ultras with relatively short loops and fixed-distance ultras (50K, 100 miles, etc..), especially those that are point-to-point. After a while in most trail races, the pack spreads out and those on the shallow ends of the Bell Curve (runners in the front and back) can find themselves pretty much alone the second half of the race. That's definitely not the case at ATY. With runners in three different events on the course at the same time, there is an interesting mix of speeds and form. Those of us who would be near the back of the pack in a point-to-point race share the track with runners for one, two, or three days who we'd normally see only at the start and finish because they'd be so far ahead of us. By the third day and night, runners who have already been out there for over 24 or 48 hours are wearing down and pacing off fresher runners who started more recently. 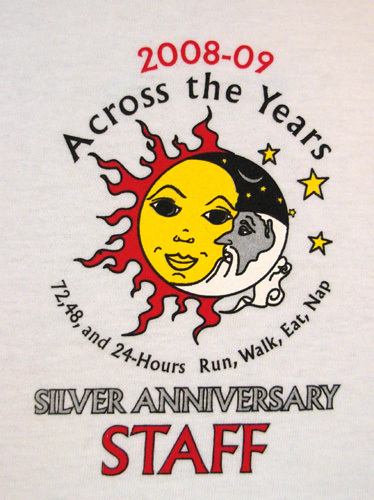 One of the coolest race experiences I've ever had was during the third night here when several of the high-mileage 48- and 72-hour runners were pacing off ME because I was walking so "fast" in comparison! I didn't notice that last year when I ran the second day. day or night, you're never alone for long in this race. One of the characteristics about ultra runners that sets them apart from runners in shorter-distance races is their camaraderie with the other race participants; your first time at ATY you discover this very quickly. Not only are most (most) folks genuinely friendly but they are also generous with encouragement and praise -- even with the runners they consider to be their competition. As in most ultras, "competitive" ATY runners of all speeds and ages tend to prefer some good competition to bring out their own best efforts. You may be the fastest guy or gal out there, but if no one is pushing you, you may not do as well as you could. Just ask Juli Aistars, Aaron Sorenson, and Martina Hausmann about this year's competition for second, third, and fourth places in the 72-hour race. By pushing each other they all finished within a small mileage range after three days and nights on the track. They may not have been very talkative the first day when they were running steadily the majority of the time (or walking fast, in Martina's case), but even they were talking more to each other and the other runners as they progressively slowed down the second and third days. There are lots of other similar stories at ATY each year. German runner Martina Hausmann (L) chats animatedly with Rick Cheever on Day 1. Veteran of many 6-day races, she racked up 231 miles (mostly walking) in 72 hours, placing 4th. At ATY all the 72-hour runners are on the track the same three days. It's easy in that race to periodically check the leader board and see how you stack up against the competition at any given time. Not so in the 48- and 24-hour races. The competitive strategy is different because there are two waves of 48-hour runners and three waves of 24-hour runners. Assuming the weather is similar on all three days, runners on the track during Days 2 or 3 have an advantage because they know what distances they have to exceed in order to win or place higher in the standings. This became apparent in the "duel" between Hans Bern-Bauer, who ran in the first wave of the 48-hour runners, and Jeff Hagen, who ran 15 miles farther in the second wave. If they'd been on the track the same days, both would likely have run even farther. Same thing in the 24-hour race between Matt Watts (Day 1) and Wendell Doman (Day 3). The placement may have been the same (Wendell went farther), but they probably would have pushed each other harder if they'd both run on the same day. This really doesn't apply to runners who are mainly trying to reach a certain mileage goal (like Jim) or to beat a previous ATY single-age record (like me). I enjoyed running the third day, however, because it was more fun being the "hunter" than the "hunted" as I watched my name rise higher and higher on the leader board! Yep, I still have some competitive spirit in me. So does Jim. Unfortunately, since he ran in the first (and smaller) wave of 48-hour runners, he saw himself slide farther down the leader board when some of the runners in the second wave caught up to the first wave. Back to the subject of socializing during the race . . . there's quite a range of "talk levels" and it changes from day to day as the runners get more tired. Ones who were running too fast to talk at the beginning of their race might become more loquacious when they have to walk more. Others are more talkative when they're fresh, then withdraw during the night when they are sleepy or starting to hurt. There are some ATY runners and walkers who love the opportunity to talk to other participants the entire time they're circling the track. It's a wonder they aren't hoarse after three days! A few are non-communicative except during breaks. Most are somewhere in the middle. Whether you socialize a little or a lot at ATY, it's fun to get to know one another better and the miles seem to add up faster when you're lost in conversation. Not all distractions are bad. Shared experiences like this can produce bosom buddies, fond memories, and perhaps even a personal record. Regardless of your speed, on a 500-meter course you can't escape the presence of other runners during this race. Some runners wear headphones so they can focus on their race (or forget about it) and not be distracted by conversations with other runners. About the only other way to avoid talking without appearing rude is to run so fast no one can keep up with you! But even the runners who are focused on personal, age, or national records usually take some time to socialize during the race. One of the new features this year was the opportunity for runners to check in and receive their bags, bibs, and timing chips on Sunday afternoon, not just the morning their race began as in previous years. The main reasons for this change were the increase in the number of runners and the desire to avoid chaos the morning of Day 1. It worked. 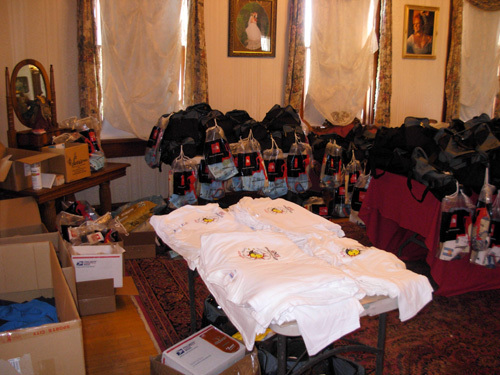 Volunteer shirts (center), 48-hour runners' bags and packets (rear). It's more organized than it looks! Rodger came up with this great idea after realizing how many runners (about 80 of them) would have to check in from 7-9 AM on the first day of the race. I had a vested interest because I was one of only two people assigned to the task that morning and I was plenty worried. I highly recommended that more volunteers be assigned to help us with the onslaught. I remembered how hectic it was last year with fewer runners, especially since several items were handed out separately from the bags. Even though all the items were in the bags and attached packets this year, having so many people sign their medical forms and check in would still be very hectic right before the race. As soon as Rodger decided to have early check-in on Sunday afternoon I volunteered to handle it. The process didn't look at all daunting spread out over five hours. If enough runners checked in that day it would reduce a lot of pressure for the runners and volunteers on the first morning of the race. But would they come? Oh, yes! To my delight, at least 60 or 70 runners, about half the field for all three days, checked in on Sunday afternoon between 1 and 6 PM. Unfortunately, I forgot to count them after checking off their names. I do know the "bag room" looked decidedly more empty by dinnertime. There were two periods of time when it took two or three of us (runners Sandy and Mike Melton helped me that day) to handle the process because several people showed up at once, but in general the afternoon was relaxed enough to be able to socialize with the runners, answer all their questions, solve all their problems (just kidding! ), and give them information they needed to know. The runners who showed up liked being able to get their bags and packets the day before the race. I did, too. As a runner, I like getting my number, shirt, and other paraphernalia the day before a race. It also made my volunteer job so much more enjoyable that day and the next two mornings (I ran on Day 3, so someone else handled the few remaining runners who checked in Wednesday morning). The new traffic pattern for check-in was also a hit with the runners and volunteers. Runners were directed into the house via the front porch this year, not the back veranda. They had lots of room to congregate in the living room (above) as they filled out their medical forms, and traffic was kept completely out of the adjacent room (next photo) with all the runners' bags and packets, volunteers' shirts, awards, etc. Registration table and room with the runners' bags, etc. 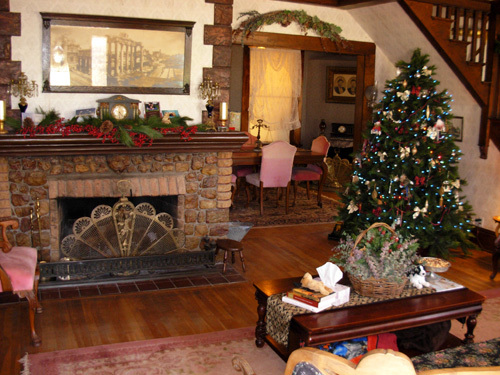 Everyone enjoyed the Wrubliks' comfortable, antique-filled living room with its beautifully decorated Christmas tree, blazing fireplace, and cookies to eat. Remember what I said about the family's outstanding hospitality in the last entry? This is just one more example. Runners also liked the duffel bags and their contents. Here's more about the new "goody bag" option at ATY this year . . . 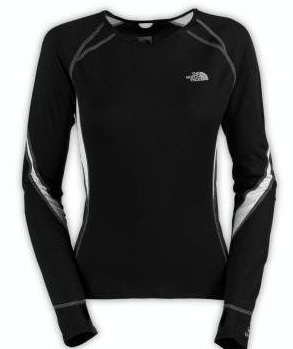 Most ultras charge one standard fee that includes a garment or some type of gear given to entrants and/or finishers. The fee may increase the closer you get to the race, but everyone pays the same amount if they enter the same distance race within the same time period -- and they all get the same stuff (commonly called "schwag," "premiums," or "goodies"). Some people don't give a hoot about the schwag or awards and just want a fun, safe, challenging race. Why should they have to pay extra for goodies they neither want nor need? 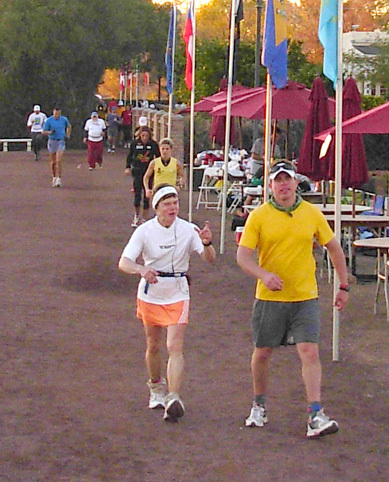 Only a few ultras give entrants the choice of paying a basic fee to run the race and paying a separate fee for a race shirt or other amenities. ATY adopted such a goody bag option for the event this year; about 15% of the runners chose to pay only the basic race fee. 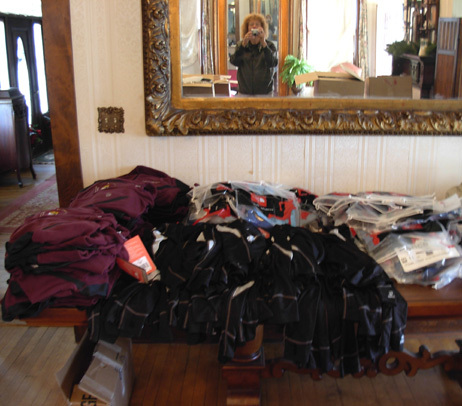 Women's fleece jackets (left) and shirts organized for bag-stuffing on 12-13-08. The photographer takes a picture of herself taking a picture . 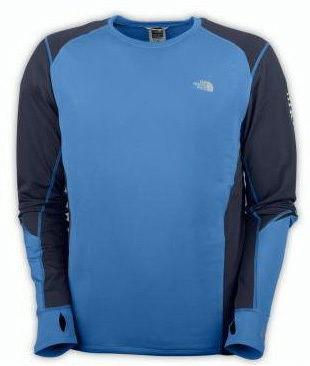 . .
Jim and I have never run an ultra based solely on the shirt or other items given to the participants. There are more important things to consider first. But it IS one of many factors we consider when we sign up for a race the second and subsequent times. Are we getting good value for our race dollar, not only in terms of good organization, nice scenery, a safe course, and aid station offerings, but also in terms of the entrants' and/or finishers' clothing or gear? That assessment can be difficult our first time at a race, but after that, we pretty well know if we "got our money's worth" in all respects and want to go back again. At the time of on-line registration for ATY last summer entrants had to decide if they wanted to spend only the basic fee for the race they wanted to run or pay an additional amount to receive a high-quality technical running shirt and fleece jacket, a well-made duffel bag with the Silver Anniversary race logo, a pair of Dirty Girl gaiters, and other items that typically retail for substantially more than what the race was charging for them (this year's shirt and jacket retail for about one-and-a-half times the fee, not including the duffel bag and other items included). That's an excellent value if you want the items because you're not likely to get them anywhere else except the race for that price -- or with the very cool race logo! 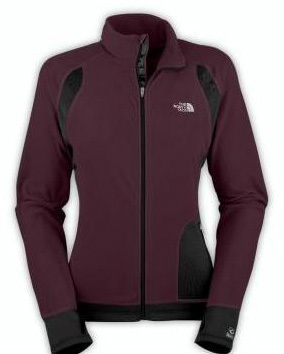 But what a great "no-bag" option for those who already have enough running clothes and/or want to economize! This year's basic entry fee without the goody bags was less than in previous years when the cost of the goodies was automatically included. That's a win-win for the runners. And the ones who took the "no bag" option didn't exactly go home empty-handed. 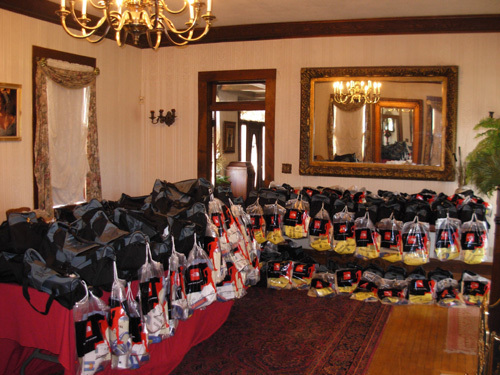 They received Drymax socks, Zombie Runner samples and coupons, Hammer Nutrition products, and some other items that sponsors provided for all the runners. That was also an excellent value. Jim and I love the Northface shirts and jackets, Dirty Girl gaiters, Moeben Sleeves, duffel bags, and other items we received at ATY last year; we didn't even have to think when registering this year before saying yes, we each wanted to pay for a goody bag. For us, it was a good deal. The decision was tougher for those who haven't participated at ATY before and didn't fully know what they might be missing. 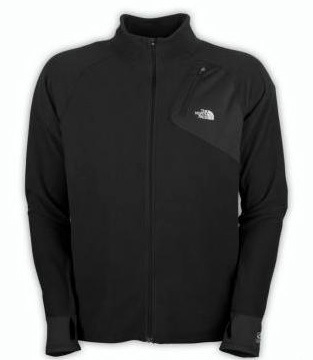 To help runners make their decision, there was a link to photos of this year's Northface shirts and jackets on the ATY web site. Anyone could go there, read about the items, see what the retail prices were, and make an informed decision. Or they could contact Paul or Rodger and ask as many questions as they wanted. We think ATY's fees are very reasonable when compared to the cost to enter other high-quality ultras around the country. In fact, they are lower than most of them, considering all the tangible and intangible things you get. The ATY race committee does a good job controlling costs. One way they do this is to order very few extra shirts and jackets beyond what the runners initially choose when they enter the race. The extras are reserved for runners who need to change sizes from what they ordered and to reward volunteers who go "above and beyond." Runners were warned in the directions before entering the race that there might not be any extra shirts or jackets if they chose the "no bag" option when they registered, then later changed their minds. I was very grateful last year when I needed to swap for a larger shirt at ATY and received one that I wear frequently and with pride. There weren't any larger women's shirts left, so Rodger gave me a men's shirt that fits me well. Since I knew this year's shirts were coming from the same manufacturer, I ordered a larger women's shirt and it fits fine. Women can choose to order men's clothing at ATY (and a few did this year) if they prefer the men's styles/colors or the sizing is more appropriate. In addition, entrants may order extra shirts or jackets (at extra cost) but they need to do this when they register. 48-hour runners Lisa Bliss and Tim Englund pick up their race bags. All but one runner I checked in on Sunday, Monday, and Tuesday seemed happy with their choice re: the goody bag. One woman who opted for "no bag" was very angry that she was unable to change her mind and get one at check-in on Sunday. She saw how nice the items were and deeply regretted her decision. (A big problem was that she didn't register herself or even take the time to read about her options.) I don't know if there was anything left after the awards ceremony on January 1 for her to purchase, or if she even stayed in town that long. Other than that unpleasant incident, I thoroughly enjoyed handling registration on Sunday afternoon and getting to see so many runners and their crews. It's definitely one of my favorite race jobs! IS JIM READY FOR HIS RACE? While I was having fun at check-in Jim was trying to rest, go over his intended race splits for the umpteenth time, and otherwise get ready to begin his first 48-hour race the next morning -- kind of daunting, I'd imagine. He emerged from the camper periodically to see what was going on and to socialize with incoming runners. He had his priorities right! There wasn't much more he could do preparation-wise anyway. I got to see and talk to more runners when they checked in at the house, but Jim got to spend more quality time with some of them outside as they shared their race goals and strategies, talked about their training for ATY, and caught up on their respective adventures since the last time they saw each other. I didn't miss much; I could do that on the track on Day 3 when most of the 48- and 72-hour runners were tuckered out and mostly walking! Jim's day was going great until late afternoon. He moved the truck alongside the camper to empty 55 gallons of water from our supplemental water tank into the camper's tank so we wouldn't run out of water during the race. Then the truck wouldn't start. Oh, no! Fortunately, it wasn't blocking the parking lot or taking up unnecessary room, but Jim wanted to move it back to its original spot in front of the camper tongue during the race. Worse, it was almost dark and he didn't have enough time to ascertain what the problem was. He located Rodger and told him why the truck was parked where it was. Rodger said not to worry; he'd help him figure out what the problem was during daylight on Day 3, after Jim's run was over. 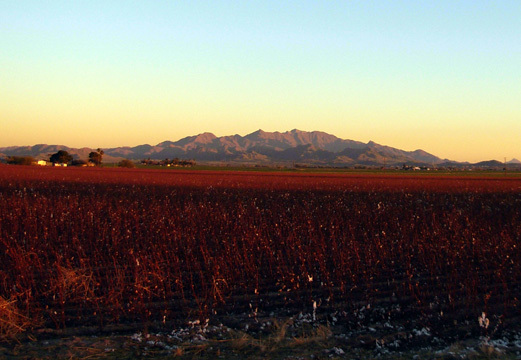 The setting sun colors the harvested cotton field next to Nardini Manor. I had no clue what happened until I closed down registration at 6 PM and headed "home." It was deja vu all over again. This was almost as bad as Leadville 2007 when the truck died a quarter mile from the start -- half an hour before the start -- and I had to hurriedly borrow runner Brent Craven's truck to crew for Jim during the 100-miler. Jim worried about that truck the entire race; it was one of several reasons he DNF'd the race. We tried to put this problem out of our minds while we ate supper and shared stories from our separate conversations during the day with running friends from far and wide. There wasn't a thing we could do about the truck for at least two more days. Thank goodness we were "stuck" at Nardini Manor with another mechanic (Rodger) and plenty of tools nearby and not somewhere in the middle of nowhere on I-10 in New Mexico. I knew Jim and Rodger could figure out what was wrong when they had the time. I encouraged Jim to put the truck out of his mind as best as he could and focus on getting a good night's sleep before his race. I was already thinking more about how to get up, get dressed, and make my coffee quietly the next morning, without waking Jim up that early, so I could get over to the house to do runner check-in at 7 AM. Both of us were tired enough to go to bed early that night. It was almost show time!! !